The Isle of Man was a mecca for holiday makers and Douglas in particular developed into one of the north west's great tourist centres. 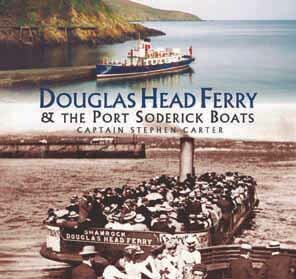 Much tourist development was centred on Douglas Head and the quickest means of access to Douglas Head's attractions, from Douglas and the steam packet landings, was by ferry across the harbour. A distinctive type of double ended ferry steamer was developed which by 1900 was carrying between half and three-quarters of a million passengers each season - a ferry service which today is virtually forgotten. Port Soderick, a cove three miles south of Douglas, was also developed to attract day trippers. A succession of boats and boatmen have been associated with this once popular boat service. With the help of some rarely seen photographs and from the vantage of a lifetime's experience working on passenger boats from Douglas, the author traces the history of these Victorian and Edwardian tourist enterprises. Recounted with obvious relish by an author drawing on his own first-hand experience and a fine collection of photographs.